Work has commenced on the restoration of Dudbridge and Foundry Locks. Restoration contractors Land & Water have set up their operations base in Avocet Park and their machines are now in action. Early stage work will involve creating a dry work environment. This has been achieved by placing a clay bund above the site to direct water past the locks. 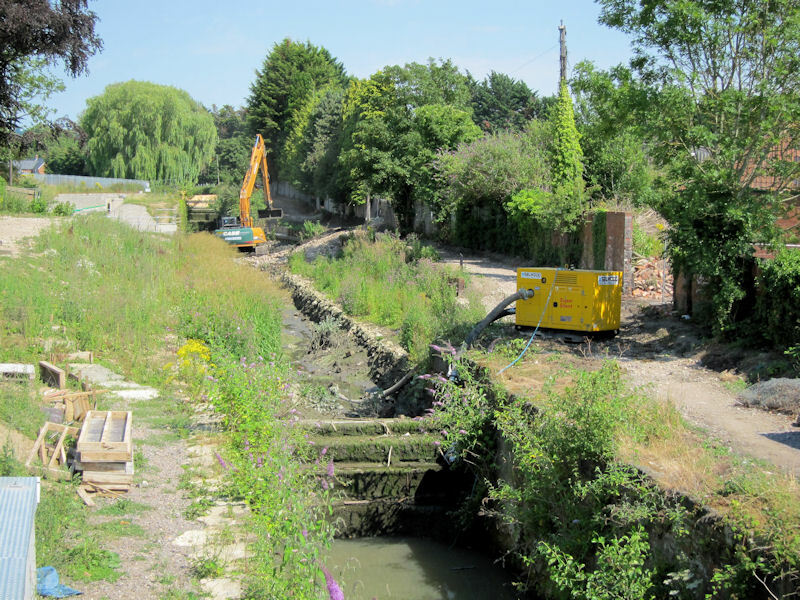 The next job is the removal of the narrow stone sided flood relief channel installed in the 1950’s. The pictures right show Land & Water's long reach excavator and 4 wheel drive dumper truck carrying out that work. The size of the machines and narrowness of the work area reveal the reason that pedestrians and cyclists will have to await completion of the lock restoration before they may once again use the towpath. The photos right were taken by CCT Trust member Robert Paget. Robert is taking a particularly close interest in this stage of the restoration as he was born in the cottage adjacent to Dudbridge Lock near the Dudbridge road bridge. The road bridge across the canal provides an excellent worksite viewing platform. Robert joined the Cotswold Canals Trust in its early days and proudly quotes his membership number as ‘57’. As well as being a long term Trust member Robert is an experienced navigator of UK waterways. It is fitting therefore that that his electrically powered ‘rib’, rigid inflatable boat, carried him and his video camera on the first powered transit of the new canal diversion beneath the railway viaduct at Capels Mill. Robert’s historic short voyage appears on the CCT You Tube site. Click here to share Robert’s view of his historic voyage along the Capels Mill canal diversion. Power generated by the recently completed hydro electricity installation running alongside the locks will recommence as soon as high priority work to the head of the upper lock is complete. Land & Water’s Senior Site Manager Chris Spencer will begin his regular Dudbridge Locks updates next week. Click here or on the You Tube icon below to see the full selection of 20 restoration videos.